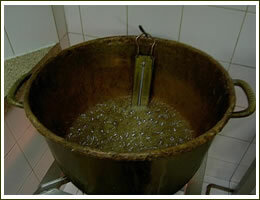 Large copper pots containing sugar, water, glucose and other ingredients are stirred and boiled to a specific temperature. Once this temperature has been reached the mixture is carefully poured onto large metal slabs and left to set. 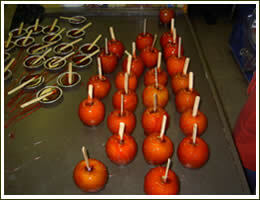 Different temperatures produce different consistencies achieving soft tablet to hard boiled candy. Buy our traditional home-made sweets here.